In the past fifteen years, file sharing of digital cultural works between individuals has been at the center of a number of debates on the future of culture itself. To some, sharing constitutes piracy, to be fought against and eradicated. Others see it as unavoidable, and table proposals to compensate for its harmful effects. Meanwhile, little progress has been made towards addressing the real challenges facing culture in a digital world. Sharing starts from a radically different viewpoint, namely that the non-market sharing of digital works is both legitimate and useful. It supports this premise with empirical research, demonstrating that non-market sharing leads to more diversity in the attention given to various works. Taking stock of what we have learnt about the cultural economy in recent years, Sharing sets out the conditions necessary for valuable cultural functions to remain sustainable in this context. An in-depth exploration of digital culture and its dissemination, Sharing offers a counterpoint to the dominant view that file sharing is piracy. 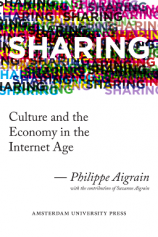 Instead, Philippe Aigrain looks at the benefits of file sharing, which allows unknown writers and artists to be appreciated more easily. Concentrating not only on the cultural enrichment caused by widely shared digital media, Sharing also discusses new financing models that would allow works to be shared freely by individuals without aim at profit. Aigrain carefully balances the needs to support and reward creative activity with a suitable respect for the cultural common good and proposes a new interpretation of the digital landscape. Philippe Aigrain is the President of Éditions publie.net, a publishing house specialized in contemporary French-speaking literature and one of the founders of La Quadrature du Net. He previously authored Cause commune: l'information entre bien commun et propriété, Fayard, 2005. He also writes poetry and fiction and translates English-speaking poetry and poetrical prose into French. Suzanne Aigrain is Professor in astrophysics at Oxford University and a fellow of All Souls College.